HomeGreeceEndgame for the Grexit, or More of the Same? As I write, just past the unmet deadline for the Greek payment of a scheduled 1.55 billion-euro debt service, it is impossible to say what the next week or month will bring. As I write, just past the unmet deadline for the Greek payment of a scheduled 1.55 billion-euro debt service, it is impossible to say what the next week or month will bring. The past week, including an IMF rejection of a Greek proposal that appeared to have had the support German Chancellor Angela Merkel and French President Francois Hollande and a snap call for a referendum on the IMF’s demands by Greek Prime Minister Alexis Tsipras, has been as politically dramatic as anything since the weekend when, following the collapse of the Lehman Brothers investment firm in 2008, the American financial system appeared to be teetering on the brink of collapse. The sums and stakes, except for Greece itself, do not appear to be anywhere near as large as they were then, but then, no country has ever been put in the position of having to leave a 19-nation currency union that represents a substantial portion of the world’s wealth either, and the political ramifications of a so-called Grexit are far more important than its economic ones, however dire in the case of Greece. For this reason, it is important to understand how a situation at least verbally deplored by all parties has come to pass. The most important fact to grasp is the nature of the European Union itself. It began as the Franco-German condominium for Western Europe known as the Common Market, in which Germany was from the beginning the driving element. Its original objective was the apparently harmless one of removing trade barriers and creating a common trade zone with a view to establishing a unified currency in due course. These initiatives required a political infrastructure, and so the European Union came into being, with a parliament to which member states elected representatives on a proportional basis. This parliament was never more than a sham; real policy and operational control rested with a Brussels-based bureaucracy that functioned through a steering committee, the European Commission, and a central bank headquartered in Frankfurt. The central bank in turn collaborated closely with the Deutsche Bank, through which Europe’s dominant currency, the mark, circulated. When a common currency, the euro, was adopted in 1991, the mark became in effect Europe’s money—and Germany continued to control it. All of this amounted to a reversal of the national democracies painfully achieved (and as painfully lost) in the 150 years of political struggle between 1789 and 1939. We need to understand what democracy could and could not do. In a capitalist system, it can do no more than provide channels for representation—or resistance—to those disadvantaged and exploited by it: industrial workers, small farmers and craftsmen, abused minorities. Peasant and labor parties arose in due course, not without strenuous resistance from elites. After 1940, Britain remained Europe’s only democracy, the Continent being divided between fascist and communist autocracies. Democracy was reinstated in Western Europe after World War II under the auspices of America’s Cold War competition with Soviet Russia, although democracies that seemed likely to produce results unacceptable to Washington were “corrected,” as in Italy and Greece, and the nonbelligerent fascist powers of Spain and Portugal were permitted to stand. America’s primary interest was in restoring liberal capitalism, not democracy; democracy was functional to it insofar as democratic states, with their changing casts of parties and politicians, were more easily herded by the international banking regime set up at Bretton Woods in 1944, including such supranational bodies as the International Monetary Fund. The tensions provoked in the Western alliance by the semi-autocratic government of Charles De Gaulle in France in the 1960s indicated the limits of independent action that Washington would tolerate. The push for a common market was partly an attempt to find wiggle room for a Western Europe structured by American interests, and partly an attempt to create a framework to contain the revived strength and ambition of West Germany. European independence—that is, the freedom for maneuver of European capital interests—was believed to be achievable only by creating a large-scale integrated economy. This was sometimes misleadingly referred to as a “United States of Europe,” but the American model was not that of a federal political union but of a common currency zone free of trade impediments under the auspices of a central bank. There were, however, two vital differences from the American model: individual states were left to their own banking and economic practices without the discipline of being required to maintain balanced budgets, and no mechanism was installed for maintaining the equilibrium of the system as a whole. The European Union was not, in short, to be a transfer union, in which a rough guarantee of solvency and basic structural support was maintained through a redistributive system that, in net terms, effected an annual transfer of funds from richer to poorer states, and provided emergency funding to forestall bankruptcies. The discrepancy between richer and poorer economies in the European Union was notionally to be fixed by a process called “convergence,” by which the latter were to be gradually pulled up to the level of the former by investment and subsidy. The “subsidies” involved directing (and often distorting) economic growth according to preconceived technocratic models liberally salted with backdoor deals and bribery. The investments, both private and public, were greased by low-interest loans, since the introduction of the euro brought down interest rates throughout the its zone—the only “convergence” that actually occurred. The result was a binge in casino capitalism, in which surplus northern capital went south with little or no restraint. On the other hand, the euro caused an immediate surge in inflation in the outer tier countries—Ireland, Portugal, Spain, Italy, and Greece—which forced workers there to increase output (that is, work harder) and take on personal debt to keep up. At the same time, governing elites in those countries were encouraged to run dangerously high public deficits whose servicing depended on projections of unending growth. Much of the “growth” fostered in this fashion involved speculative or luxury projects of little or no value to ordinary citizens and often involving disruption and ecological damage. Every visitor to Greece can cite his or her favorite example. Mine (apart from the unending scandal of the Athens-Patras highway), is the hideous road that was gashed into the side of a mountain on the island of Donoussa for the ostensible purpose of connecting four hamlets with a total population of seventeen souls. The point to understand about Greece is that its public indebtedness, while relatively high, was no more than that of other some other industrialized countries, for example Japan and New Zealand. It had no reason to fear imminent bankruptcy; it was driven there by a deliberate constriction of credit and by its inability to devalue its national currency to correct its foreign payment imbalance, having of course surrendered the drachma in adopting the euro. This left it without resources to deal with predatory creditors, short of a default on its debt and a return to a drachma sure to be painfully discounted on international markets. The Greeks were, in short, pushed to the wall. The reason for this was the worldwide financial crisis of 2008, which left banks and sovereign entities that had deliberately exported capital to fiscally vulnerable states and private borrowers exposed to trillions of dollars of losses. Greece was only one among them, and the case of Spain is a more revealing example. The Spanish economy was driven to an unemployment rate in excess of 25% not because of its public debt but, as in the case of Ireland (and to a considerable extent even in the world’s economic powerhouse, the U.S.), by a collapse in a private housing market deliberately inflated by subprime loans. Compensating (not “repaying”) the banks, many of them French and German ones, for the losses incurred by the housing bubble was made the task of the Spanish taxpayer. It was not enough to dispossess millions of Spaniards from their homes; their economy had to be ransacked by a shakedown policy called “austerity.” Of course, the banks did not have the authority to simply do this on their own. That was where the European Union—bankers plus unelected bureaucrats—came in, putting the fig leaf of sovereign legitimacy on simple highway robbery. We should not regard this as a tale from far away; exactly the same thing happened in the United States, where banks were bailed out to tune of trillions in loans and guarantees, and seven million American families were dispossessed from their homes as state and federal governments stood by watching with studied disinterest. “Austerity” was applied here too by severely cutting social services and public sector employment, and a prolonged depression was deliberately hatched in the name of monetary policy. If the consequences were less severe than in Spain and Greece, the reason was that the federal government stepped in to avert state defaults. But a vast amount of suffering was wilfully inflicted, here as in much of Europe, for the sole purpose of keeping private banking, investment, and insurance interests afloat, and restoring them to obscene profitability as quickly as possible. An interesting counterexample lately in the news is that of Puerto Rico, an American protectorate whose citizens have no federal voting rights, and whose government was not required to balance its books. The American military substantially colonized it over a period of decades; the withdrawal of this investment, and that of private corporations that found Puerto Rican pension and benefit plans overly generous—the same complaint leveled at Greek workers—has contracted the island’s economy and sent its deficit skyrocketing. Puerto Rico, that is to say, has been treated by the United States substantially as much of southern Europe was by the EU. The federal government’s initial reaction to the crisis was a shrug of unconcern, but Puerto Ricans do live and vote on the American mainland, and President Obama has apparently thought the better of antagonizing Hispanic voters in general. No such problem troubles the gnomes of Zurich, Brussels, and Berlin. They have shown themselves perfectly comfortable with the idea of forcing Greece out of the eurozone, indeed even eager for the experiment. They have shown what the EU represents: the hegemony of finance capital, in which corporations are not only persons with citizen rights as in the U.S., but the only citizens there are. To put it another way, the relationship of the wealthier parts of Europe to its poorer ones is that of imperial colonization. Empires used to require states, but banks and multinational funds have taken their place, and in entrapping Third World states in debt cycles for the purpose of labor and resource extraction they have set the world model for neocolonial exploitation. When such states have been sucked dry, they are left to collapse into anarchy and civil war. The Greek case differs only in that Greece is the birth mother of Europe itself. Plato was not a Finn. Aristotle was not a Belgian, and the Germans were running around in their skins while Greece was giving what would become Europe its art, science, and philosophy. Apparently, motherhood gets you no points on the Frankfurt exchange. What has happened in southern Europe, what is happening now in Greece, is only the first chapter in the story, for eastern Europe is now being teed up for similar treatment. The story gets more complex, too, because we have thus far left out a critical component of it: Germany. As I have noted in previous articles, the containment of German power between 1870 and 1945 was the chief preoccupation of Europe, a problem only partly and temporarily deferred by the postwar partition of Germany. The EU was, at least in the eyes of some of its founders, a means of providing a permanent solution by incorporating Germany in a supranational entity. This was, simply, a catastrophic miscalculation that has become a terrible failure. By failing to develop a democratic political structure in tandem with its economic base, the EU created a vacuum that its dominant member, Germany, stepped in to fill. Each member state of the EU ceded important sovereign powers; each was, accordingly, de-democratized within the Union itself. To understand this a little better, let us imagine an autocratic regime seizing power in Washington, and gradually imposing its control on the states. Each state might still have its own constitution and vote for its own governor and legislature, but how long would states’ rights meaningfully exist? State governments, even if still popularly chosen in contested elections, would produce only servants of the federal government, bound to carry out Washington’s will on pain of the direst consequences—even, say, expulsion from our own Union. No, Angela Merkel hasn’t declared herself Empress of Europe. She doesn’t need to; what’s important is that the fiction of representation be kept up, that EU policy be seen as reflecting a democratic consensus of its members. But the EU’s governing mechanisms are, first of all the German state, and secondly the financial institutions with which it works hand in glove. The euro itself was never subject to popular approval or referendum, but simply declared by fiat and confirmed by adherence to a treaty worked out in secret. When Sweden balked at this at the time and subjected the euro to its own national referendum, it was soundly and wisely defeated. Britain, of course, refused the euro out of hand. Neither country has had cause to regret its action. This brings us to the present situation. Alexis Tsipras was elected prime minister of Greece to refuse further demands for austerity. He has had five months to prepare the Greek people for an orderly exit from the eurozone and a return to a national currency, the country’s only hope to regain control of its political, economic, and moral destiny. He has failed to do so, instead engaging in diplomatic brinksmanship with various EU and IMF functionaries and showing little control of either his agenda or his party. What forced him to finally act was a personal and national insult such as few foreign leaders have been asked to publicly endure. On Monday, June 23, Tsipras presented a fresh set of proposals for a bailout extension to Merkel and Hollande, the parties with whom he had insisted on negotiating as fellow sovereign representatives. Both responded positively, indicating that a deal could be expected. Instead, however, Tsipras received the text of his proposal back from the IMF two days later, without even the courtesy of a typed response but simply marked up in red ink like a failing schoolboy’s exam. Merkel and Hollande, meanwhile, were smirkingly silent. I cannot recall the elected leader of a nation ever being humiliated in so public a fashion. Tsipras responded by calling a snap referendum, cloudily worded, whose gravamen was a request for acceptance or rejection of the terms demanded in the IMF’s response. Since the terms were not actually final and represented only one of the negotiating parties, it was not clear what a Yes or No vote would actually signify. Merkel immediately put her own gloss on it, however: she said that a No vote, as requested by Tsipras, would be a vote to leave the eurozone. She thereby turned an internal political process into a personal ultimatum addressed, above the head of Tspiras, to Greek citizens themselves. Need I add that her “interpretation” ignored the fact that no mechanism exists for expelling a member from the eurozone, and therefore that it carried no legal implication whatever? The practical meaning, however, could not be missed: Defy us further, and we will slit your throats. The referendum itself was symptomatic of Tsipras’ failure to develop the consensus necessary for decisive action. 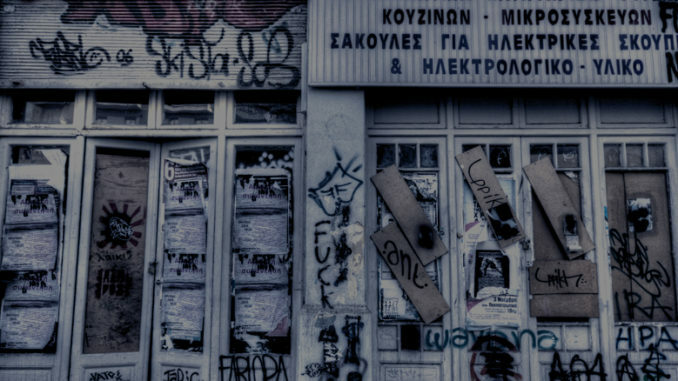 Syriza’s victory in the January 25 polls was a mandate to reject further austerity, but it was not an agreement on how to proceed beyond that. The risks of converting one’s life savings or pension benefits into a currency of uncertain value are grave, and people fed up with being bled dry might understandably be reluctant to risk being drained of what remained all at once. With a government new to power, itself riven by very public divisions and holding a one-seat parliamentary majority, the task of unifying the country around a fresh course of action could only have fallen to Tsipras himself. It is the tragedy of the moment that he has not only shirked this task, but behaved as if unaware of it. Since June 25, Tsipras has seemed a man in a panic. He announced the referendum to the country in a 1 a.m. address, not the hour chosen by Churchill to speak before the Battle of Britain. Within two days, he was back with further proposals to his creditors, thus mooting the IMF’s response on which the referendum was based. At this point, the Delphic Oracle herself may not be able to say what a Yes or a No vote will actually mean. It will certainly not be the clarifying political stroke that Tsipras presumably intended. If a weakened Tsipras capitulates to creditor demands—I use the word ‘creditor’ advisedly, since I do not believe the so-called debt is a genuine obligation, but only a theft of national wealth extracted at economic gunpoint—then he will lose all entitlement to govern, and the country will have been even worse served than by the quisling regimes of George Papandreou and Andonis Samaras that preceded him. If he is pushed into issuing a replacement or parallel currency without a consensus behind him, he will risk a division that may not be possible to resolve within the existing political order, and that may lead to the second suspension of Greek democracy within fifty years. The moment is perilous, and the outcome highly clouded. The one thing clear to me is that the people who invented the idea of freedom are still the ones who cherish it the most. The hope must be in that.